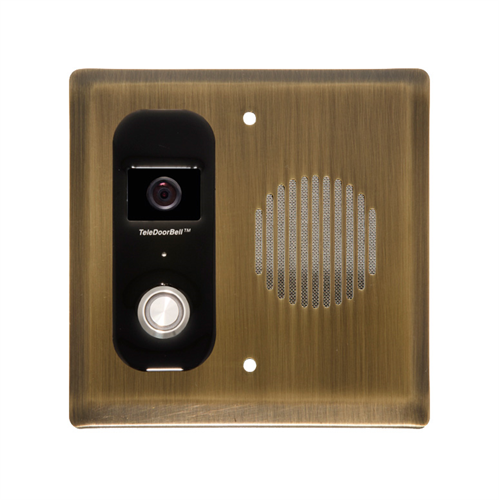 This IP enabled video door intercom station, when combined with the TPC IP controller will enable on-site and remote Internet video and audio communication with the front door. TPC sold separately. Teleport from Logenex is a network and Internet-enabled front door Intercom and Camera system that provides the ultimate in convenience with two-way audio and video in the palm of your hand. Answer the door, have a two-way chat and even unlock the front door from anywhere in the world via the Internet, or inside your home using an Android or iOS smartphone or tablet. Teleport door intercoms also support ONVIF for integration into NVR systems for recording. This model comes in an Antique Brass finish. Teleport does not have any setup or monthly fees!